This 8 Stage Shower Filter is much like it's sister product the 4 Stage, however with this unit it uses a double cartridge, giving you 8 stages of filtration, yes you read it correctly 8 stages of filtration. With an easy to use flush system it will give your unit extra life without having to constantly replace the cartridges. 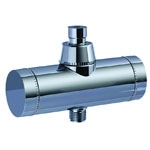 Both units are stand out products when it comes to shower filtration. But again you can use these units in the shower, the bath, or even use it on your washing machine tap, the choice is yours. If you haven't read this case on the 4 stage page, then you really need to read it now to fully comprehend what is in our water system. A case in question: A middle aged woman left Australia for an overseas destination for a body detox procedure, she was enjoying fresh un polluted water, showering and drinking this clean source of life, upon returning to Australia after only a couple of days of being back here, she broke out in rashes, and irritated skin, all from our own water here in Australia. What we must say though is she left to detox her body because she was initially suffering skin irritations in the first place, after several days in her overseas location her skin complaint healed up completely, but that all changed back to normal when she arrived back to Perth, Western Australia and started using good ol aussie water again. The Conclusion: Well you don't have to be a rocket scientist to work out the harshness of our water causes not only skin complaints but many others. So because of so many requests for us to develop a substantial shower filter we have come up with not one but two new units. These are the Rolls Royce and Bentley's of Shower Filters, they are not cheap and nasty plastic units like you see on the market, they are solid, backed by our no qualms 12 months warranty. If you are using a Reverse Osmosis Unit, or buying expensive bottled water because you hate the taste of the tap water, then you really NEED to consider buying a shower filter, no use giving your body pure water for drinking, but when in a hot shower or bath when your pores open up and take in massive amounts of chlorine and fluoride and calcium and copper, then you are defeating the whole purpose. If you haven't purchased one of our Reverse Osmosis Units, but were considering it, then check out the shop, we are now doing excellent 'combo' deals, buy a R/O unit for drinking, and one for showering or bathing. These units have a multitude of uses, you can also use it when doing your laundry.